Nakajima back in San Diego with the Greats! Cross-Disciplinary Productions explores the dynamic interaction between art and society through the distinctive philosophy of the UCSD MFA program. This exhibition is the second in the series for the current academic year focusing on the identity of our department. The first exhibition mounted in the Fall “The San Diego Effect” centered on the identity of place through works by MFA students at UCSD and San Diego State University that engaged with greater San Diego as a locale. The upcoming exhibition tracks our identity through time as it is revealed by the personal stories and careers of artists from our department. Participating artists: David Antin, David Avalos, Rebecca Baron, Doris Bittar, Harold Cohen, Joyce Cutler Shaw, Joelle Dietrick, Steve Fagin, Manny Farber, Katie Herzog, Louis Hock, Allan Kaprow, Christopher Kardambikis, Jeff Kelley, Hung Liu, Fred Lonidier, Simone Lueck, Kim MacConnel, Babette Magnolte, Owen Mundy, Ryuta Nakajama, Leslie Nemour, Mark Oliver, Sheryl Oring, Patricia Patterson, Jerome Rothenberg, Italo Scanga, Louis Schmidt, Ernest Silva, Brianna Rigg, Perry Vasquez, Yvonne Venegas, Andrew West, and Minori Yata. 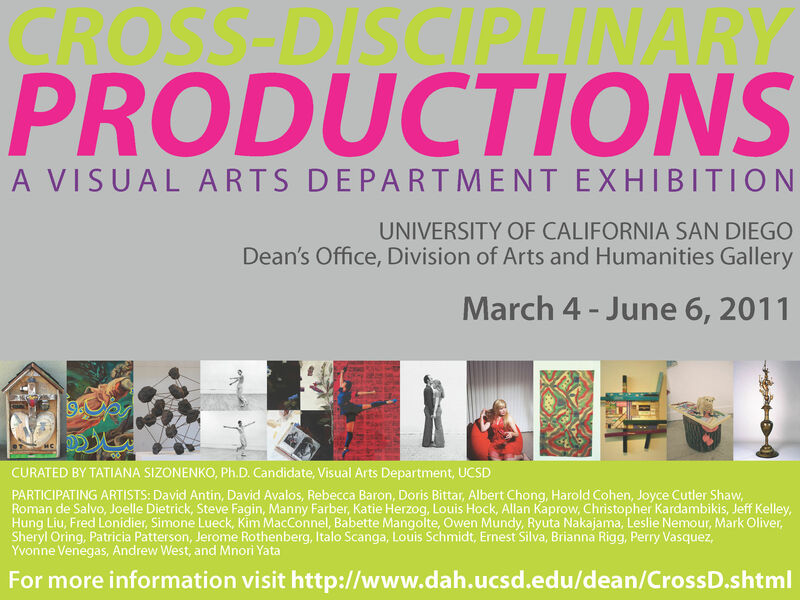 In recognition of the 50th anniversary of the founding of UCSD, the Division of Arts and Humanities will be hosting an exhibit celebrating the artistic identity of the Visual Arts Department, running from March 4 through June 6, 2011. Cross-Disciplinary Productions is curated by Tatiana Sizonenko, a PhD Candidate in Art History. The exhibit will present a survey of works by its founding and long-term faculty, most distinguished alumni, and current MFA students. The Visual Arts Department was founded on the principle that art production, art theory and criticism, and art history are inter-related practices which together constitute the world or culture of art. This exhibition investigates the various ways that the department’s distinctive commitment to the theoretical framework of art was put into practice and whether this shared philosophy about the theoretical framework of art constitutes a tradition in the contemporary world. Cross-Disciplinary Productions explores the dynamic interaction between art and society through the distinctive philosophy of the UCSD MFA program. This exhibition is the second in the series for the current academic year focusing on the identity of our department. The first exhibition mounted in the Fall “The San Diego Effect” centered on the identity of place through works by MFA students at UCSD and San Diego State University that engaged with greater San Diego as a locale. The upcoming exhibition tracks our identity through time as it is revealed by the personal stories and careers of artists from our department. The exhibition pre-view reception will include a lecture and conversation with artist / critic / theorist Allan Sekula (UCSD/MFA 1974) and historian / critic / curator Moira Roth (Professor at UCSD 1974-85) who will discuss the history of UCSD MFA program and their own work. The pre-opening is scheduled for March 4, 2011 at 2pm in the Visual Arts Facility, performance space. Following the talk there will be an exhibition preview viewing with the curator on March 4 at 4pm in the Literature Building. The exhibition opens to full viewing on March 11, 2011, with a special guest Jeff Kelley (MFA, UCSD 1985), an art critic, theorist, curator, and educator, currently residing in Oakland. Jeff Kelley will lead an enactment of Allan Kaprow’s “Easy” (1972) with PhD and MFA students (by RSVP). David Antin, David Avalos, Rebecca Baron, Doris Bittar, Harold Cohen, Joyce Cutler Shaw, Joelle Dietrick, Steve Fagin, Manny Farber, Katie Herzog, Louis Hock, Allan Kaprow, Christopher Kardambikis, Jeff Kelley, Hung Liu, Fred Lonidier, Simone Lueck, Kim MacConnel, Babette Magnolte, Owen Mundy, Ryuta Nakajama, Leslie Nemour, Mark Oliver, Sheryl Oring, Patricia Patterson, Jerome Rothenberg, Italo Scanga, Louis Schmidt, Ernest Silva, Brianna Rigg, Perry Vasquez, Yvonne Venegas, Andrew West, and Minori Yata.